This map illustrates the satellite detected surface waters in Manica and Sofala Provinces, Mozambique, as observed from the Sentinel-1 imagery acquired on 19 March 2019. 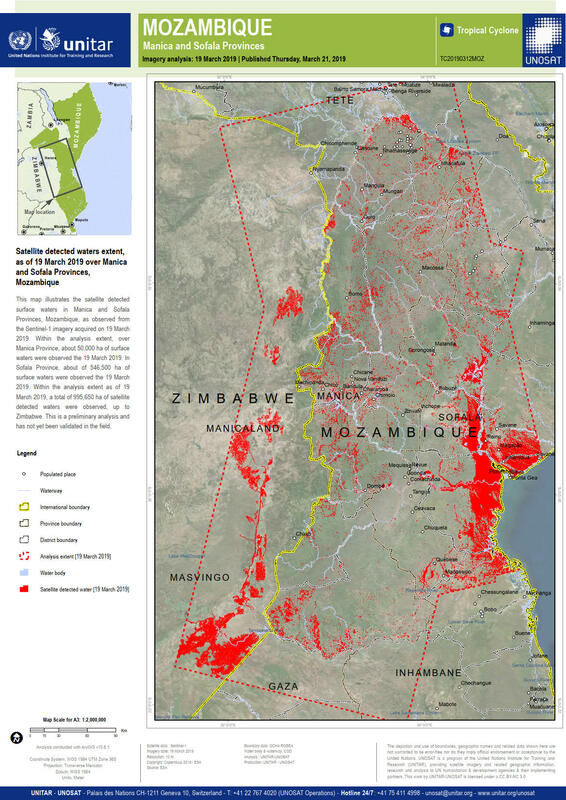 Within the analysis extent, over Manica Province, about 50,000 ha of surface waters were observed the 19 March 2019. In Sofala Province, about of 546,500 ha of surface waters were observed the 19 March 2019. Within the analysis extent as of 19 March 2019, a total of 995,650 ha of satellite detected waters were observed, up to Zimbabwe. This is a preliminary analysis and has not yet been validated in the field. Please send ground feedback to UNITAR - UNOSAT.